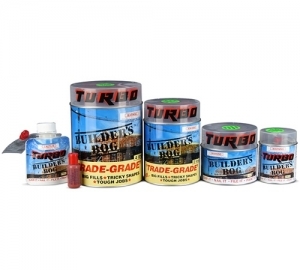 Turbo Builders Bog is a trade quality timber repair filler designed for use by builders and painters but equally popular with DIY enthusiasts – It’s like wood in a can! Turbo Builder’s Bog is a two part polyester filler which is ideal for filling large imperfections in timber, like window sills, doors or where there is rot and it’s difficult to repair. All you do is mix together the two components supplied, following the instructions about the correct amounts of each, and fill the hole or damage using an excess which is then very quickly removed by cutting, paring, surforming and then sanding to shape before it sets hard. This high grade product mimics the behaviour of wood.